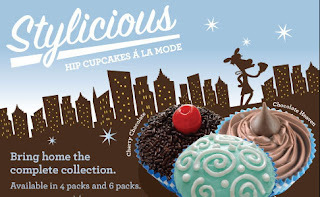 Maggie Moo's Ice Cream & Treats announced the introduction of their Stylicious: Hip Cupcakes a la mode. Maggie Moo's is the first company to bring us ice cream cupcakes, even before Cold Stone Creamery. Maggie Moo's is expanding their existing ice cream cupcake line (that is featured on the Food network) to include new designs and flavors. You will also be able to customize with your favorite flavor, topping, and mix-in. I have actually never been to Maggie Moo's before. The closest location to me is probably Ladera Ranch or Chino Hills. These cupcakes look like they have more cake in them, something I hear that Cold Stone is lacking. Looks like it will be worth a test taste. Anyone tried one yet? their ice cream cupcakes are actually really good! there used to be a Maggie Moo's in Laguna Niguel and one in Lake Forest, but they closed down and i'm so bummed about that because they actually are way better than Coldstones, IMO. btw...i didn't see this in your lists of cupcakeries visited, but driving around Pasadena this weekend we saw two new "Dots Cupcakes" within a couple miles of each other. I didn't get to go in, but i wanted to let you know about them in case you are in the area and get a chance to go. Cheryl- I just recently looked at Crumbs website because I heard that you can buy their cupcakes online. I've never bought cupcakes to have shipped before so I'm thinking about trying it out. I hear their cupcakes are amazing. Maybe I will have to try them out soon. And thanks for the tip about Dots Cupcakes. A cupcake tour is a great idea. There are so many places to visit outside of Orange County. I've got a Maggie Moos right near me, but I've never tried their ice cream cupcakes. I'll have to check it out sometime.